With the league having been wrapped up weeks ago, now it’s just a question of how many points Kogalo will amass and whether any Kogalo player will finish as league top scorer. And Kogalo continued to keep their foot on the accelerator pedal when they beat Kakamega homeboyz on Saturday 1-0. The goal came via Jacques Tuyisenge who tapped in a George Odhiambo cross. BlackBerry leads Kogalo in assists this season and it will be critical for Kogalo to bring him back next season. A Jacques Tuyisenge first half goal is all Gor Mahia needed to down 10-man Kakamega Homeboyz 1-0 in a Kenyan Premier League match staged at the Mumias Sports Complex on Saturday 11 November. The Rwandan scored the all important goal in the 44th minute tapping home a George Odhiambo cross. 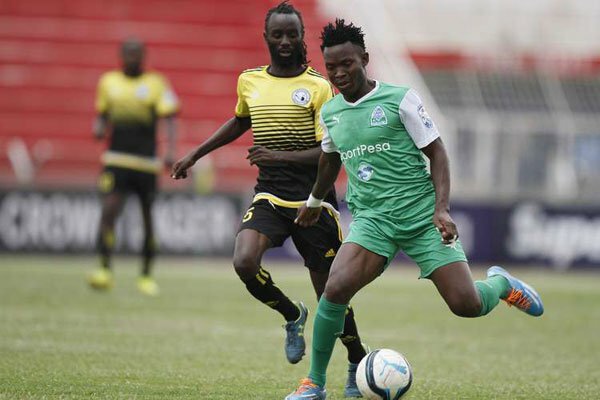 The hosts missed a penalty in the 20th minute and had striker Wycliffe Ochomo sent off in the 37th minute for elbowing Gor Mahia midfielder Ernest Wendo. The game started on a balanced note as both teams looked to control of the clash. The chances were few in the opening minutes as they both approached the match cautiously. 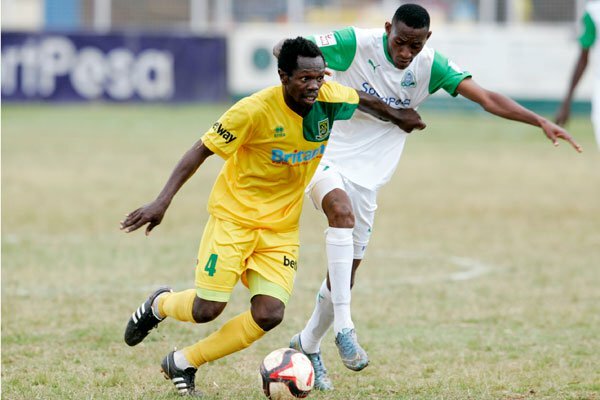 The first chance of the match came in the 20th minute when Shaban Odhoji fouled former Gor Mahia striker Wyclifffe Ochomo in the area and a penalty was awarded to the hosts. Jeremiah Wanjala stepped forward to take but Odhoji did well to save the spot-kick. Three minutes later Homeboyz nearly paid for the miss when Jacques Tuyisenge was put through on goal but with only keeper Michael Wanyika to beat the forward shot directly at the shot-stopper who did well to save. Eight minutes before the break, Homeboyz were reduced to ten men when Ochomo was given his matching orders for elbowing Ernest Wendo. With a one man advantage, Gor Mahia began raiding Homeboyz in search of the opening goal which they got just before the break when Tuyisenge tapped home a George Odhiambo cross much to the dismay of the home supporters. 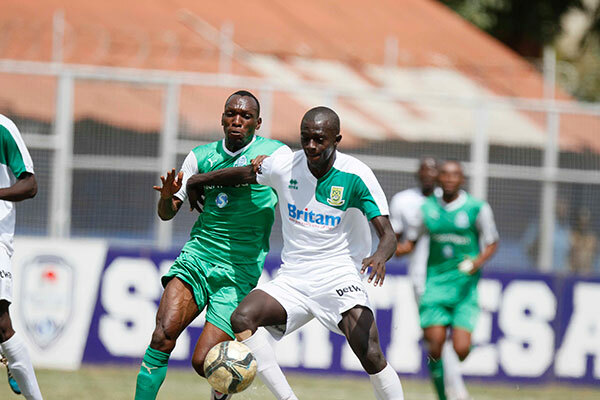 Gor continued dominating proceedings after the interval in search of more goals, Wanyika did well to deny Tuyisenge on a one on one situation in the 59th minute and a minute later the forwards’s powerful header from a Francis Kahata corner kick hit the side net as they went all in attack. Homeboyz’ lone attacking outlet was half-time sub David Okoth whose crosses from the left flank were not utilized. Collins Kisuya had a go at goal from range in the 70th minute but his attempt narrowly missed the target. Wanyika visibly the busier of the two keepers once again came to Homeboyz rescue in the 72nd minute parrying a George Odhiambo dangerous cross in the 72nd minute with Jacques Tuyisenge ready to pounce. Francis Kahata saw his shot go wide while Meddie Kagere’s looped effort seven minutes from time went narrowly wide. The champions couldn’t find a second goal as Homeboyz defended deeply to win. 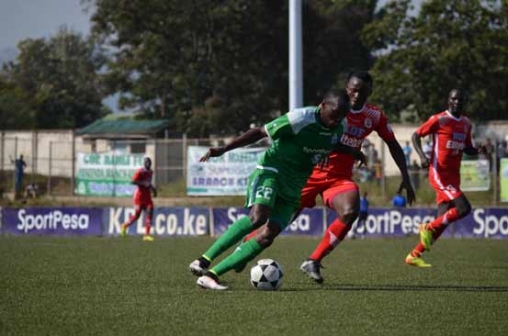 Gor Mahia and Zoo Kericho settled for a 1-1 draw at Afraha stadium on Sunday. Coach Kerr gave opportunities to several players who have not had chances throughout the season. The exceptions were Kagere and Tuyisenge who are still chasing the golden boot. First chance for Gor Mahia fell into the hands of Oliver Maloba but he did not do good enough to beat only Vincent Misikhu in goal in the 8th minute. Anthony Mbugua on his part showed some brilliant touch with the ball but his final shot was too timid to trouble Zoo keeper. Zoo were presented with their first chance when Nicholas Kipkirui put a through ball for Geofreey Gichana but the midfielder failed to connect into the net in the 17th minute. Kipkirui again showed intent in the 29th minute when he effortlessly went past stagnant Joash Onyango for his shot to go off target finally. The affair remained less dramatic towards the end of first half thus the score remained 0-0 as the teams went back to the tunnel. The second half came with Zoo getting the first corner that was taken by Chetambe but his delivery was not clinical enough. Wellingtone Ochieng stopped Kipkirui from wrecking havoc in the 50th minute. A one two between Tuyisenge and Kagere failed to open the score as the later failed to connect well in the final stage of the move. Meddie Kagere finally scored for Gor Mahia in the 62nd minute when he volleyed the ball into the net as he intercepted a Boniface Omondi flick. Gichana turned the assist maker when he passed a sumptuous ball to Kepha Ondati for the later to equalize in the 75th minute. Subs: Fredrick Odhiambo, Ernest Wendo, Joachim Oluoch, George Odhiambo, Francis Kahata, Timothy Otieno, Jeconia Uyoga. Coach Dylan Kerr suffered his first defeat as Kogalo coach when his side went down 0-1 to Mathare United at Thika municipal stadium. It was a mirror image of the first leg. Gor Mahia seem unable to adapt their game to that field. 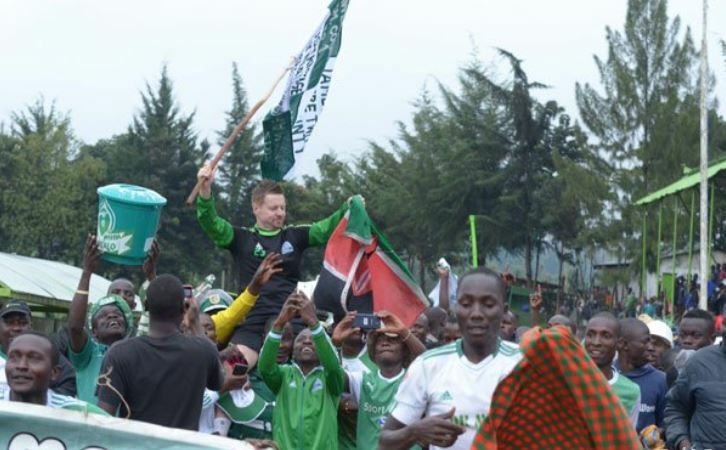 Mathare United handed coach Dylan Kerr his first defeat after edging out Gor Mahia 1-0 in a Kenyan Premier League match at Thika Stadium on Saturday. 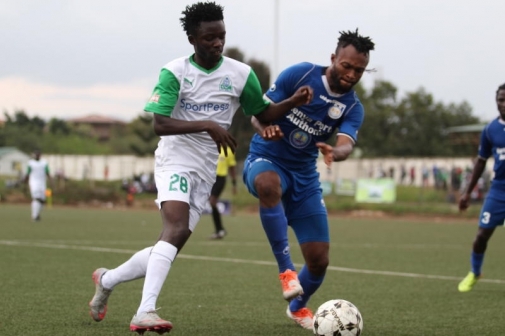 Chrispine Oduor’s goal in the fifth minute made all the difference as Mathare United completed a double over the KPL league leaders by an identical scoreline. Gor Mahia had started well with Meddie Kagere breaking free from the right and beating Samuel Olwande in defence but his resultant effort went wide. Two minutes later, Gor Mahia were forced to make an early substitution when Ian Wafula was brought in for Karim Nizigiyimana. Then the tide quickly turned as Mathare seem to take control and the result was their early goal. Oduor created space for himself on the left and picked out Cliff Nyakeya who returned the favour and the latter beat Boniface Oluoch with a low shot at the bottom right corner for Mathare’s opener in the fifth minute. After the goal, Mathare continued to pile pressure. In the 21st minute, Edward Seda’s free kick from the edge of the box went inches wide. Then two minutes later, Boniface Oluoch was forced to come out to deny Mathare United once again from a corner kick. Nyakeya’s shot in the 33rd minute went just wide. One minute later, Gor Mahia midfielder Francis Kahata was denied by Lewis Opiyo in goal for Mathare from a well taken volley. The Slum Boys were the more ambitious side at the start of the second half with Chris Ochieng’s shot blocked by Oluoch. At the hour mark, Edward Seda’s free kick hit the Gor wall. Jacques Tuyisenge came close to equalising for Gor, but his header hit the roof with a quarter of an hour to go. Kahata was denied once again by Opiyo from a free kick as Gor continued to pile pressure. Gor Mahia’s march towards the 2017 Kenya Premier league continues this Saturday when they take on Mathare United. Gor Mahia now need only four points to win the league. And if Sofapaka and Homeboyz slip up again, then a win against Mathare could very well give them the title. Mathare for their part are in 15th place and are desperately battling relegation. It is a dramatic change in fortunues for a team that won the Kenya Premier League in 2008. A team that penned one of the most lucrative sponsorship deals last year and was thus expected to challenge for the title. It is also a dramatic change in fortunes for coach Francis Kimanzi who as recently as 2012 was considered the best coach in Kenya. Kimanzi and his team knows that Mathare cannot afford to slip up and must battle. ” It’s the big one this weekend. The lads are fired up for the Saturday clash against league leaders Gor Mahia. Interestingly, we are one of the three sides that have managed to beat K’Ogalo this season, the club exclaimed. Save for Wycliffe Kasaya and Roy Syamba, it’s a full house in training and the mood in camp is great ahead of the task ahead” said a post on the club’s social media pages. The last encounter between these two sides was in April at Thika stadium. Mathare won 1-0. The goal was scored by Cliff Nyakeya, a former Gor Mahia youth player, assisted by Derrick Onyango, also a former Gor Mahia youth player. And this is another area where Mathare’s fortunes have changed. It is they who used to be a pipeline of talent with many former Mathare Youth players playing for clubs all over the country. On Thursday morning, Gor Mahia played a friendly against Ulinzi and won 4-2 with goals by Timothy Otieno, JB Mugiraneza, Mike Simiyu and Boniface Omondi. This according to team official Judith Nyangi. 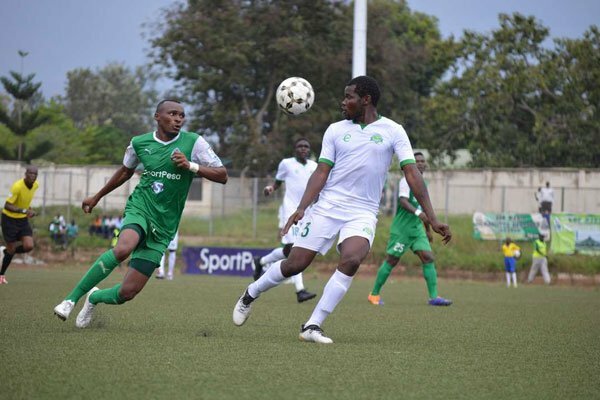 Gor Mahia will take on fourth placed Sofapaka on Wednesday in Kisumu. It is the first match since both teams had points deducted after the high court ruling that nullifed results against Nakumatt and Zoo Kericho. Gor Mahia are now on 45 points, still 9 points ahead of Sofapaka. Gor Mahia will be looking to put some distance between them and second placed Kakamega Homeboyz. “Our targets are the same for each game. We want three points. That requires good preparation and strategic approach and that is what we have done,” said coach Dylan Kerr to the Nation. Sofapaka will be trying to reboot their title hopes which have stalled in recent matches. “Playing Gor Mahia in Kisumu will be a tough endeavour. That is the best team in the country right now but we shall give our best,” said Sofapaka’s Ugandan coach Sam Ssimbwa to the Nation. Last weekend Gor Mahia put on what was perhaps their most spirited performances against defending champions Tusker under difficult rainy conditions. And coach Kerr was impressed with his side.